Red Army Standard ammo is manufactured in Romania using some of the same equipment used to produce Soviet stockpiles during the Cold War. As a result, you can be confident that these rounds were made to perform reliably in your AK47. This ammo features berdan-primed, non-reloadable steel-cases that are coated in polymer to ensure that these rounds feed smoothly into your rifle. Each round features a 123 grain FMJ bullet that makes this round a great choice for your next trip to the range. 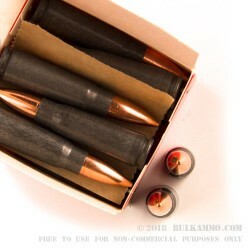 Unlike most cases, this round features 54 boxes of 20 rounds of 7.62x39mm ammunition for a total of 1080 rounds for those of you bulk shooters who aren't quite satisfied with just shooting 1000 rounds! Q: Does this ammo come in a sealed tin i.e. spam can? A: Hello, These 123gr. FMJ rounds by Red Army in 7.62x39 do not come in a spam can. They come in boxes of 20 rounds each. These make great target rounds in 7.62x39. Q: Does the projectile of these rounds attract a magnet or no? A: Hello, These 123gr. FMJ rounds by Red Army in 7.62x39 have a lead core, but they sometimes use a bi-metal jacket so they do attract a magnet. For non-magnetic rounds, I would suggest a brass cased round. Q: My local range accept steel case but don't allow bi-metal jacket bullet. Can customer service help verify the bullet is not bi-metal (non-magenetic) before shipping? A: Hello Frank, These 123gr. FMJ rounds by Red Army in 7.62x39 have a lead core, but they do sometimes have a bi-metal jacket so they will attract a magnet. For a non-magnetic round, I would suggest a brass cased round. Q: Is this ammo bi-metal jacketed or will it pass the magnet test? A: Hello, These 123gr. FMJ rounds by Red Army in 7.62x39 have a lead core, but they sometimes have a bi-metal jacket and they do have a steel case and will attract a magnet. For non-magnetic rounds, I would suggest a brass cased round.